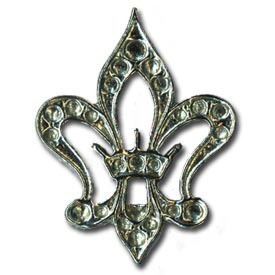 Open worked Fleur de Lys Pin with a central crown. The “Flower of the Lily,” emblem of the French Kings, was officially adopted by the French monarchy in the 12th century. This symbol, most commonly derived from the flower of the Iris, was used on the armor of the royal house of France as well as on the clothing of the French kings. Pewter, 1 1/4" by 15/16" Made in USA.